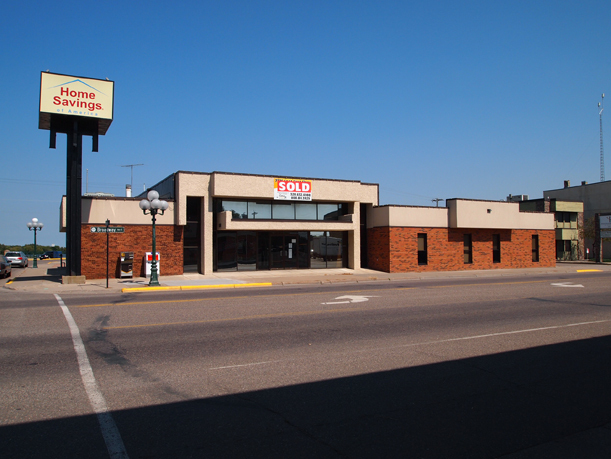 This building served as the home of Little Falls Federal Savings & Loan, Community Federal Savings & Loan, and Home Savings of America on East Broadway in Little Falls, MN. Photo taken August 28, 2012, five months after the Office of the Comptroller of the Currency closed Home Savings. Photo by Mary Warner. Driving home from work around 5 p.m. on Friday, February 24, 2012, I saw something strange going on at Home Savings of America, the bank on East Broadway across the street from the post office in Little Falls. The place was swarming with people, the parking lot filled with imposing SUVs and law enforcement vehicles. It looked like a federal raid. And, in a way, it was. Agents of the FDIC spent months at the bank, combing through records and readying physical assets – bank furnishings, office equipment, the building – for public sale. An online auction of the interior furnishings was held through Penny Worley Auctioneers in July 2012. 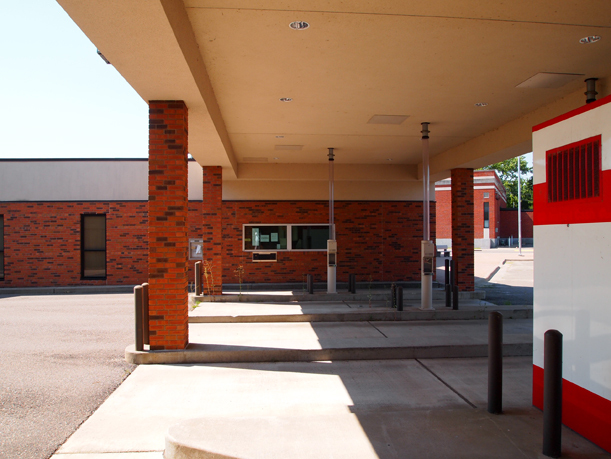 The building was purchased by Central Minnesota Credit Union in August 2012. Through the closing of Home Savings, Little Falls became a community directly impacted by the home mortgage banking scandal that has been a key feature of the severe economic downturn that began in 2007. As of September 28, there have been 42 failed banks in 2012, including Home Savings, which had three other branches in California. While Home Savings failed due to “troubled assets,” a term often used in relation to current bank failures, what’s unusual in this situation is that the FDIC could not find another bank to purchase Home Savings, partially because it was so severely undercapitalized. In examining online financial reports, even more striking is how quickly it became undercapitalized. 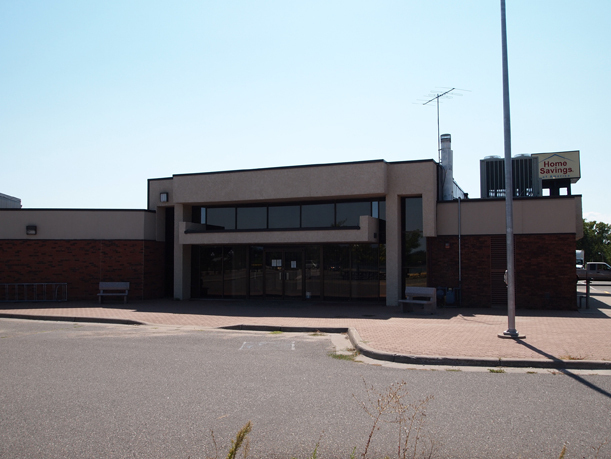 The north side of Home Savings of America, Little Falls, MN, August 28, 2012. Photo by Mary Warner. Home Savings of America started life as Little Falls Federal Savings & Loan in 1934, when a group of 30 investors paying $100 each applied for a charter in May that year. Temporary officers of the new organization were J.C. Patience, president; A.F. Koslosky, vice president; and John Vertin, secretary. (LF Herald, May 11, 1934) The charter was granted and on July 12, 1934, the stockholders held their first official meeting, during which J.C. Patience, Aloysius Simonet, Austin Koslosky, William Molde and John Vertin were elected to the board of directors. The first location of Little Falls Federal was in John Vertin’s office at 70 East Broadway. In 1943, when W.C. Weber replaced John Vertin as secretary-treasurer, the association relocated to his office at 117 First Street SE. In 1956, the organization moved again because Weber’s office next to the Falls Theatre was too small. The new location, which opened November 7, 1956, was at the corner of First Avenue and First Street SE, Little Falls. In 1973, with assets of close to $20 million, Little Falls Federal moved into a brand-new modern building designed by Minneapolis architects Dykins-Handford, Inc., at 35 East Broadway, across from the post office. Community Federal Savings & Loan granite sign behind the building. 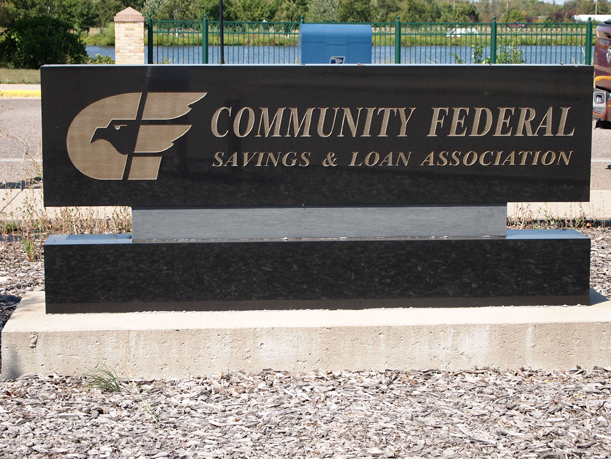 This sign was not removed when the institution changed from Community Federal to Home Savings. Photo by Mary Warner, August 28, 2012. Community Federal continued to do well through the following couple of decades, with assets at $68.7 million as of June 30, 1999, and $81.7 million as of December 31, 2004, according to public disclosure documents filed with the OCC. One year later, in June 2011, it was undercapitalized and by September 2011, it was considered a failed bank. The OCC closed the bank and the FDIC moved in to take it over in February 2012, causing quite the stir in Little Falls. Drive-thru at Home Savings of America. Photo by Mary Warner, August 28, 2012. And a once-solid institution in Little Falls died a dramatic death after over 77 years of service to the community. This article first appeared in the Morrison County Historical Society newsletter, Volume 25, Number 3, 2012.
want to check if account available and close it. You’ll find contact and other information there to help you deal with an account. According to the page, those who had an account were to be sent a check and a final statement from the FDIC. I hope this helps clear things up for you.